NRE vs NRO account for NRIs- What’s the difference & How to choose? Just became a Non-Resident Indian? Or planning to go abroad for work? Then this post is for you. When you become an NRI, one of the first and foremost issues that you face is regarding your bank account in India. Why is this an issue? When going abroad for work one needs to change their savings bank account to NRE/NRO according to an RBI Mandate. Now that you know the reason, let us find out which bank account best suits your purpose while being an NRI. 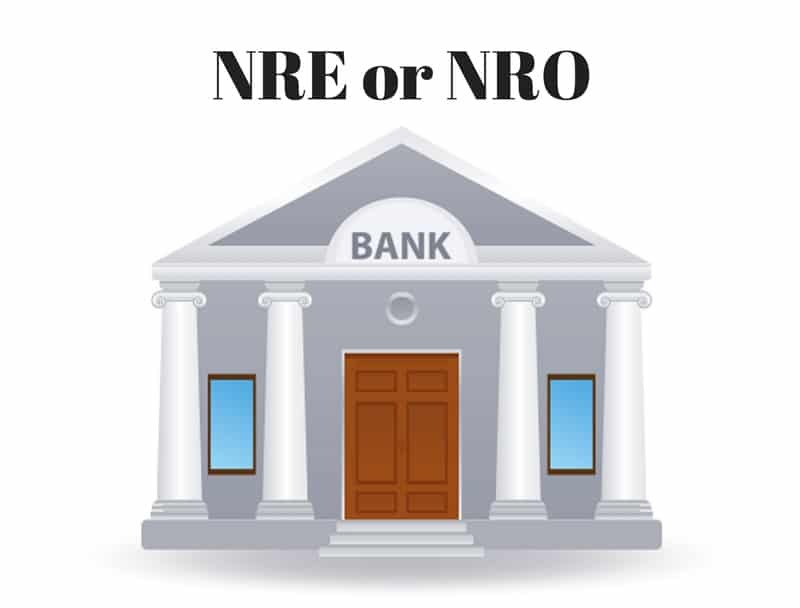 NRE and NRO account serve different purposes of an NRI. Depending on your usage, you may select either one or in-fact even open both the accounts. NRE or Non-resident External account is for NRIs who wish to save the money they earn abroad in a bank account in India. In an NRE account, you can only deposit foreign currency. This currency will be converted to Indian Rupee at the prevailing exchange rate set by the bank at the time of deposit. The interest earned on your NRE account balance is tax-free. NRI account can be savings, current, recurring or fixed deposits. If you are sending money from abroad to India for long-term savings or for investment. Interest earned on balance in NRE account is free from tax in India. There is no limit to the amount of money being sent from abroad to NRE account in India. NRE account can be held jointly with another NRI. Monthly minimum balance to be maintained ranges from Rs 50,000 to Rs 1 Lac depending on where your bank branch is (Rural/Urban). Can’t manage earnings in India in this account as only deposits from foreign countries are accepted. NRE account can’t be held jointly with resident Indians (close relative). Choose an NRE Account if; You want to save your money earned abroad in a bank account in India. Since NRE account balance is tax-free this allows you to accrue savings long term for your retirement or investments. NRO or Non-resident Ordinary Rupee account is for NRIs who wish to deposit their rupee earnings in India from rent, interest, and dividends etc. They can also deposit earnings in foreign currency to their NRO account. However, maximum up to $1 million total/year can only be received in this account. Also, the interest earned on the balance in NRO account is subject to taxation. Please Note: Your rupee earning from India cannot be deposited into NRE account and hence NRO account is needed for that purpose. If you want to manage the money you are earning in India through rent, investments etc, you can use an NRO account. NRO account can be held jointly with either an NRI or a resident Indian. Monthly minimum balance to be maintained is Rs 10,000, much lower than NRE account. There is a limit to money being received through NRO account. Maximum US $1 million can be received/year. Interest earned from Balance in NRO account is subject to taxes. Choose an NRO Account if; You want to save and manage your income originating in India by way of rent, investments, or dividends etc. Please Note: NRIs can transfer money from abroad to India without having to pay tax for the same in India. As per the Double Taxation Avoidance Agreement (DTAA) signed between India and other countries, a taxpayer abroad need not pay tax again in their home country (India), for sending the same money. Also, if you are an NRI who wants to send money home for medical expenses or as gift to your parents/children, it’s better to send directly to their savings account in India. Also Read: What Is The Best Way To Send Money To India For NRIs? Choosing the right NRI account depends on the financial needs of you and your family back home. If you think you would send back to India more than 1 millions US dollars/year, then an NRE account makes more sense for you. If you want an account where you need to manage your earning in India from abroad, then an NRO account is the one for you. Ultimately, with both NRE and NRO accounts, managing and investing your money as an NRI is made more easy and secure.